Vehicular emissions account for 80% of pollution in Metro Manila. According to studies, the average 24-hour Nitrogen Oxide (NO2) level in Epifanio delos Santos Avenue (EDSA) is over 4 ½ beyond the health limit set by the World Health Organisation (WHO), subjecting Filipino commuters and motorists plying the major thoroughfare every day to respiratory diseases and health problems. The level of air pollution is significantly higher than that of Shanghai, China, and contributes immensely to the degradation of air quality and the environment. We have one world and we breathe the same air, therefore we have a common responsibility of improving air quality. Air pollution is everyone’s problem. Every time we drive a car or ride a bus, we add pollutants to the air that harm people. To help combat air pollution one wall at a time, Pacific Paint (BOYSEN®) Philippines, Inc. spearheaded the One Wall, One World initiative, through its latest paint innovation BOYSEN® KNOxOUT, the world’s first air-cleaning paint with CristalActiv photocatalytic technology, which takes out harmful Nitrogen Oxides or NOx that we put in the air. The One Wall, One World campaign, an advocacy project spearheaded by BOYSEN® in partnership with the Clean Air Initiative for Asian Cities (CAI-Asia) and the Philippine College of Chest Physicians (PCCP), aims to have as many walls in Metro Manila painted against pollution. 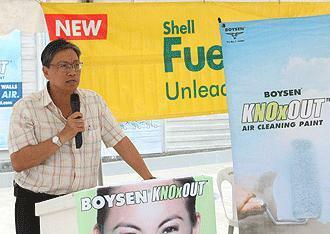 In support of this initiative, Shell, which has a long standing partnership with BOYSEN®, is making Shell retail stations as air purifiers, in line with Shell and BOYSEN®’s common advocacy of creating a cleaner and healthier environment. “I am glad that both our companies are working together for a very important cause. 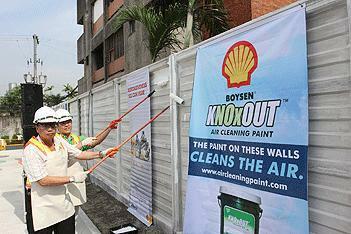 By painting the Shell stations with BOYSEN® KNOxOUT, Shell is boldly taking the initiative to be part of the solution to air pollution. It will help reduce Nitrogen Oxides in the air, making reduction of noxious gases equivalent to planting 50 mature trees,“ said Pacific Paint (BOYSEN®) Philippines, Inc. Vice President Johnson Ongking. 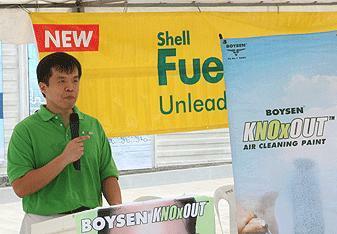 “The innovative technology of BOYSEN® KNOxOUT, proven to purify noxious gases such as nitrogen oxides and particulate matters, perfectly complements the staunch advocacy of Pilipinas Shell towards caring for the environment and promoting sustainable development,” said Shell companies in the Philippines Country Chairman Edgar Chua. 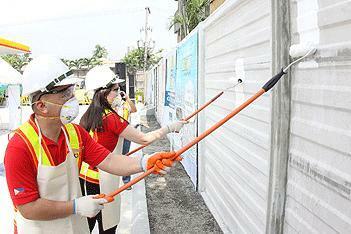 Shell companies in the Philippines Chairman Edgar Chua and Pacific Paint (BOYSEN®) Philippines, Inc. Vice President Johnson Ongking turn Shell Florida station along EDSA into an air purifier by painting its perimeter wall with BOYSEN® KNOxOUT, a Filipino innovation that’s been proven to take away 10 cars’ worth of emissions per square meter painted. 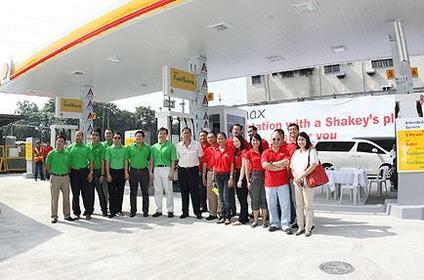 Other Shell retail stations that have been painted with BOYSEN® KNOxOUT are Shell Kanlaon in NIA and Shell Mercedes in Pasig City. KNOxOUT has demonstrated its ability to clean the air during numerous tests and trials a few years back. This Filipino innovation is proven to take away 10 cars’ worth of emissions per square meter painted. Essentially, it is essentially an air purifier first and a paint, second. KNOxOUT contains CristalActiv photocatalytic technology that absorbs energy from light and transforms ordinary water vapor into free radicals, which then break down noxious air pollutants, such as nitrogen oxides (NOx), that come into contact with the surface. 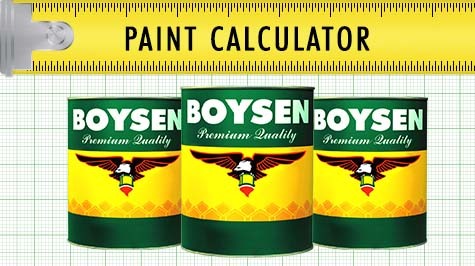 BOYSEN® KNOxOUT also has a self-cleaning feature that keeps painted surfaces looking fresh while other surfaces turn grey from air pollution.